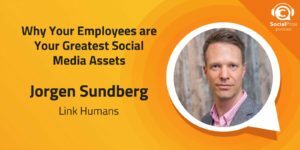 Jorgen Sundberg, Employer Brand Consultant & CEO at Link Humans, joins the Social Pros Podcast to discuss the important role of your employees in social media. There’s a reason Amazon has a “verified purchase” badge on buyer reviews. It only makes sense to value the opinion of someone with actual proven experience with a product over someone who might not have any. The same is true with brands, and who better to hear from than a company’s own employees? Not only can they help provide interesting content and ideas for consumers, but they can also help you “market” to potential new employees as well. Whether in the form of reviews in places like Indeed and Glassdoor or through more structured, branded content, your employees are an invaluable asset when it comes to your social marketing strategy. Rather than focusing on social, Jorgen’s advice is to be a “life pro” first. In order to be good at social you have to have something good to talk about! Jorgen would love to speak with Donald Trump. He would love to just have a chat and try to know what goes on inside his head! Jay Baer: Hey, everybody. It's Jay Baer, founder of Convince & Convert. Welcome to another episode of Social Pros, the podcast for real people doing real work in social media. Joined as always by my special Texas friend, the Executive Strategist for Salesforce Marketing Cloud, Mr. Adam Brown. Adam Brown: I'm great! I am really excited about this show, 'cause Jörgen Sundberg is a very very insightful individual as it comes to, in kind of employee/employer branding, and it's kind of a topic that's near and dear to my heart because, as you probably know, Salesforce, we were named best company to work for, number one for the first time. We've been on the top 10 list for the past, ah, four or five years, but we named number one just a couple of weeks ago. So, it's interesting to hear Jörgen's perspective on kind of employee/employer branding, and kind of looking at what our internal HR and marketing and communications teams do in that regard. Jay Baer: Yeah. Incredibly important part of the social media ecosystem, this idea of using social to become an employer of choice, to recruit better people. And it's a great conversation with Jörgen Sundberg, from Link Humans in the UK. You're gonna enjoy this episode of the show. Before we get into our conversation with Jörgen, I wanna remind you of the sponsors of the show this week. As Adam mentioned, Salesforce Marketing Cloud just named best place to work. Also an awfully smart crew over there. Not just Adam, but everybody. They've got an e-book that I want you to download called, The Business Leader's Guide to Becoming a Social Business. 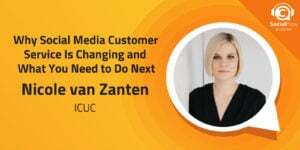 It talks about how to assess your current social media team, how to track missed opportunities, how to position social for real success in your organization, and how to analyze the results of your social media. You should download it as soon as the show's over. Also this week, Adam's super excited. A brand new sponsor of the show, Hyp3r. Carlos Garcia, the CEO of Hyp3r, was actually on the podcast a few weeks ago, and bingo bango, now they're a sponsor of the show. Hyp3r is a location-based marketing platform. Their technology unlocks powerful geo-social data that helps you acquire and engage high-value customers when they're on your property. So imagine you are running a hotel or you're running an event like Phil Moad from the Calgary Stampede who will be on the show in a couple of weeks, and you need to know, "Hey! What are people saying about our business while they're on location?" Hyp3r services that data for you and allows you to interact with that individual instantaneously. It blends the physical and digital worlds. Really interesting stuff. You can also use it for some really slick competitor analysis as well. Hyp3r is partnering with the world's leading brands in the hospitality industry, travel, and fitness. They work with Marriott 24-hour Fitness, Norwegian Cruise Line, Hard Rock, The Golden State Warriors, and a bunch of others. So check it out. It's called, Hyp3r. It's H-Y-P, the number 3-R. Let me give that to you again, 'cause it's a little bizarre. H-Y-P, the number 3-R. And if you go to hyp3r.com/socialpros they'll give you all the information. Check it out. You'll like it. And welcome to the show from Hyp3r! Let's get into our conversation this week with Jörgen Sundberg from Link Humans in London. Jörgen Sundberg is the founder and CEO of Link Humans in London, an employee branding, employee advocacy consultancy. Jörgen, welcome to Social Pros. Jörgen Sundberg: Thank you very much, Jay. Thank you very much, Adam. I'm really delighted to be on it. Jay Baer: We're delighted to have you here, because over the last, I don't know, what do you think, Adam, the last year or so. Jay Baer: Yeah. Something like that. We've had a number of guests on Social Pros talking about employee advocacy and using social to activate employees. And certainly, I think, it's on trend as we've talked about here on the show. And we all have heard about this in the social media community, the decline of organic reach is targeted mostly at businesses. And so, if you can get your existing employees, or your existing customers for that matter, to tell your story, you're going to reach more people in a way that's also more trusted and persuasive. And that's some of the work that you do, but you do a lot of other really interesting work at Link Humans, just around how businesses, you know, get better employees essentially, to become an employer of choice, I think is the term in the industry sometimes. Can you talk a little bit about how Link Humans works, please? Jörgen Sundberg: Yeah, absolutely. So we're essentially an employer brand agency, based in London, serving clients globally. And there are three strings to what we do. What, there's strategy, there is activation, and there's brand asset creation. And typically the most of the work, the bulk of the work that we do goes into the strategy side of things. It's really researching, understanding what a company's like as an employer. And both from an external perception, but also internal. And really to try to build on some of the positives, but also try to be very honest with people saying, "We are really good at this, but if you're looking for this and that, then we're maybe not the right employer for you." So, to me, it's all about really communicating who you are authentically. And then building some content around that, building platforms around that, and of course, activating that. Try to get onto the radar for perspective talent people who would like to join a company. And I think that's really where employee advocacy, social media, and all these digital bits, and they fall into place. Jay Baer: And it's incredibly important this idea of having a brand that creates really value in the mind of the potential employee, because you have said that reputation is more important than money to the job [inaudible 00:05:40]. Jörgen Sundberg: Well, just like, you know, you've ... you guys all know, iPhones, I take it? Jörgen Sundberg: You've paid a premium because it's got Apple on there. It was made by Apple. So you pay a premium for that brand, 'cause you have a sudden expectation. An employer brand, and in Thailand it kind of works the other way around. People are willing to perhaps take a slightly less salary to work for a company that has a super strong employer brand. So, ultimately, if you're doing employer branding right, you can get above-average talent at above salaries. Sorry, average salaries. And so, that's how you invert it. Jay Baer: It's fascinating to me that employees, or potential employees, are thinking that way. And I guess it's because now they can put that on their resume, and maybe down the road, not only can they tell their friends, "Hey, I work for whatever company," but maybe that helps them in the next position, right? It gives them ... They catch up to that premium down the line some time. Jörgen Sundberg: Absolutely. And especially when you're starting out, having a big brand name on your CV, on your resume, that's gonna help you to pick and choose your second and third jobs, potentially. And also, I think, when you get to a certain point, when you're making a few hundred thousand a year, then it's less about those extra few thousand increments, and it's perhaps more about where you work. And also, looking at what a company stands for. The purpose, the mission, all these bits. You know, look at a guy like Elon Musk and his companies. You know, he can probably make some really low offers to people. They're still gonna come and work there. You know, other companies in the, you know, Silicone Valley can do the same, so yeah, that's how it works. 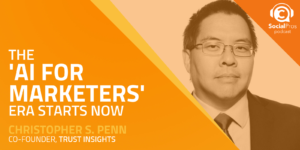 Jay Baer: Well, one of the things that must be challenging for you at Link Humans is that sometimes what a brand says they are on the marketing side is not necessarily what the brand actually is on the employee side. How do you align those? Or do you not try to? Do you say, "Well, it's okay to say that these are kind of, they're our key values and we're talking to customers, but when we're talking to potential hires, we're gonna say something different." And then, of course, you, in many cases, I suspect have a different group that you're working with. Marketing versus HR, for example. I know that's an oversimplification, but it has to be a little bit of a challenge for you, I suspect. Jörgen Sundberg: Yeah. 'Cause some companies do really well. So, for instance, let's look at Nike. They have one tagline. What is it again? Let's do it! No. Just do it! I almost forgot it. Just do it. It's been around for so long. And it can apply to so many things, you know. What does it mean? It perhaps mean, you know, just do the job you love, or it means just go out for a run, or join a softball team. So that's fantastic. So they sort of have one brand, one and the same for employer brand and for the consumer brand. But then you have other companies like Google. Virgin is another one, a huge one out of this country, where they're seen as quite a cool brand, trendy, lots of fun, but they also have done a lot of work on their employer brand. 'Cause it's slightly different. The experience is slightly different. It's not you're flying Virgin Atlantic. You'd be served cocktails with a smile. That's great. But when you're working for Virgin, it's actually one of the pillars that they've got there is hard work. So don't expect that it's just champagne and roses working at Virgin. Yes, it's a great place, but they also expect a lot in return. So some companies really need to draw the lines and demarcation and say, "Yeah, this is who we are publicly, but also you should know this if you're thinking about joining us." Adam Brown: Obviously, as you said, Jörgen, the idea of demonstrating that a brand essence is, and working at a brand is fun, it's exciting, is it's beneficial to your career, it's important. I'm curious how important a company's social persona is to kind of driving that message. 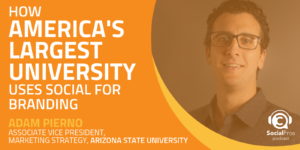 How important is, not only what they're targeting to employees, and perspective employees, and former employees will come back to alumni, 'cause I know that's something that's really meaningful to you. How important are all those posts in kind of establishing that brand? And do you believe when you talk to these companies, whether they're big companies like Virgin or smaller companies, are they thinking about that? Do they have that mindset that, "Yeah. Not only do we need to reach our customers, but we need to reach our potential employees and our past employees." Jörgen Sundberg: Yeah. And I think it depends on what accounts are doing the talking, so ... And there'd be, going back to Nike or Virgin. They all have separate accounts for, you know, this line, you know, add Jordan sneakers, for instance. But when it's Nike Corporation talking or Virgin Group talking, then there's a slightly different message, and it's more about, yes, it'll be investor relations perhaps and some press releases, but also very much about the people and the experience of working there. So that's hugely important and I think, in terms of the social persona, it should really reflect what it's like on the inside, and that this is, you know, a big challenge that we have to deal with because a lot of corporate communications departments, they wanna play it safe. HR, by definition, it's all about playing it safe as well. So we try to instill in them that we need to be creative, we need to try to perhaps utilize some of the employee voices that we can find as well. So I think a great way of doing that is by using these hashtags, for instance. Like you've seen perhaps Life@Sap, Life@Adobe#, where you actively encourage employees to share stories about what they've been up to, sort of in the context of employment. It could be that they're out doing a charity run, or they did a bake-off sale, or it's just an office picture. But by using a hashtag, that can then be ordered on whether it's on Instagram or Twitter and create community, but it for people currently working inside the organization, but also others that are looking into an organization and thinking, "Should I join these guys?" So, yeah, absolutely lots of things you can do there. 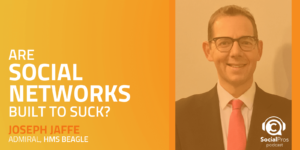 Jay Baer: Jörgen, one thing I wanted to ask you on a somewhat related point is how important is it, or perhaps you believe it's unimportant entirely, to have separate social channels for employer brand purposes? So should life at Adobe, for example, have its own Instagram account, its own Twitter account, or should those messages be interwoven into the traditional branded accounts using the hashtags that you mentioned? Jörgen Sundberg: Yeah, it's a great question. And I think it really depends on what industry you're in. So if it's B2C, you potentially have different accounts for some of your consumer brands. And then it's probably good to have an overall brand which ties it all together. So, for instance, here in London, we are opposite the offices of Viacom. So Viacom, they run MTV, Nickelodeon, The Nature Channel, and all these things. But ... So they all have their individual accounts, but when you're looking at employment, it's all Viacom. So that has to be the one account. Now, when you're working B2B, there isn't really that many consumer campaigns going on, so then it's usually one and the same account. So that's normally how it goes. Adam Brown: As a great followup to Jay's question, my question for you, Jörgen, is not only maybe do you have separate accounts for kind of your HR activities versus kind of your commercial activities, but how segmented do you get actually in those employee or prospect employee mentions? Obviously a large company like Virgin, they're trying to hire pilots, they're trying to hire executives, they're trying to hire flight attendants. And the messages for those distinct audiences may be very different. So when you're working with larger companies, do you tell them, "Listen. You need to have kind of one all-employees message." You know, talking about the corporate culture and things like that or should you be very prescriptive in the way that you may talk to a meteorologist prospect for a Virgin is very different than you may talk to an executive that may be very different than a ground, you know, support employee? Jörgen Sundberg: Yeah, I think it's ... So, in general of rule, you sort of want to tie all of these bits together, because that's what make the Virgin brand really strong. So, you know, we do have pilots and we have telecoms engineers working in the group. So the general messaging should be that. Perhaps telling stories about different functions and different divisions and so on. But then also specifically if you're running a campaign, typically in the most companies I speak to, they're in a traditional industry, they're a leg as a business, but they're all looking, screaming out, in fact, for tech people, for developers, for engineers. And that's when you might have to change the messaging a bit, that you're really thinking about what are some of the buttons that work for them. And that could be separate campaigns. You could also do campaigns that are only seen by these people, especially if you do paid social, then you know, you don't wanna waste money on people who are not developers, so you only want them to see it. But taking it one step further, it's also when the internal recruiters, when they reach out, they're the ones that are gonna have to have slightly different conversations. And most often than not ... more often than not, this will happen. Perhaps on LinkedIn, maybe on Twitter, or other places like GitHub and so on. And that's when they really need to think about the messaging for different personas. So we work with some companies that have up to 20 different personas of people that they are looking to recruit. So, yeah, for sure. Adam Brown: Yeah, that's a lot of different potential audiences of just prospective employees. As you're working with these brands, and as you're working to recruit these employees, how are you measuring the success of what you're doing at Link Humans? Is it, you know, trying to drive more interest or chatter around particular employment? Is it getting more resumes submitted to a brand? Is it the quality of those candidates? How do you kind of work towards that, and how do you look at the activities you may be doing in social as driving those positive behaviors for metrics? Jörgen Sundberg: So social has lots of benefits. One might be awareness, which is a little bit harder to measure. However, of course, when people take action, then on the sort of platforms you get that information, but also if they go into a funnel. So they apply for something, or they just request a conversation. Then that can be tracked. And also if that, let's say that resume leads to an interview, which leads to a placement, then that's one tick. But then also, is this a quality hire? Does this person stay with the company? Will they get promoted? Do they come up with innovative things? So it takes a while to measure some of these bits. The marketing ones can be very quick to measure. However, let's just say some of the softer HR metrics would be ... take time. But I think it's important to look at a number of these. I think quality of hire is probably the ultimate one you want to do. But then again, if a company's looking to, you know, they're setting up a ... You can imagine Amazon setting up a H2Q, which probably be somewhere on the East Coast? Who knows? Adam Brown: Or maybe here in Austin, Texas? Jörgen Sundberg: Yes. Maybe. Well, someone said Jeff Bezos, he's got a house in New York and Washington, so he's gonna want one of those places. Jay Baer: He owns the Washington Post, so that seems to maybe be an indicator. Boy, that's a lesson they need in Metro Washington, there's more traffic. But who knows? Jay Baer: One thing I wanted to ask you about, Jörgen, is this notion of employers creating, not just a social content, not just Twitter and LinkedIn, and to some degree, Instagram content, but longer form content. One of the things that we've worked on at Convince & Convert with some of our clients. And we do some of the similar kind of work to what Link Humans does, is worked with employers on creating their own blogs or podcasts, or e-books, or sort of a longer form, what you might consider quote unquote "content marketing" on behalf of the employer. But how do you feel about that kind of initiative? I know that you have a podcast called, The Employer Branding Podcast. Episode 177 you're on right now. So this no joke. You've been at it almost as long as Adam and I. So congratulations on that. Jörgen Sundberg: Yeah. So I think it's really powerful. So this comes back to you could be under the umbrella of employee advocacy where, essentially, you're encouraging your people to be active on social and to create content. And some of the benefits around that would be, you know, they can build their own personal brand along with the company brand. If you can get them to blog or create content that actually sits on the company's domains? Fantastic. But they may want to do it on their own. So perhaps on their LinkedIn profiles or they have their own YouTube channel. Ultimately giving people a bit of freedom, a bit of leeway, to stimulate some creativity is going to benefit both the employee as well as the company. Jay Baer: That's a big range. Jay Baer: I think if a t-shirt or a trip to Hawaii, one of those two things. Jay Baer: One thing I wanted to ask you as well, and I've experienced this in our own consulting practice, and I suspect you have as well, is that I believe that every employer has lots of great stories. You know, any employer at any scale has lots of amazing stories and really interesting people who are doing interesting work. It just can't be helped, right? But A) in many cases the people who are doing that work don't believe the work to be that interesting, 'cause it's what they do every day, right? Jay Baer: You sort of have ... you have proximity bias there. It's, "Well, it's not that interesting 'cause that's what I do every day." And so they don't think it's a story. And/or B) getting that story pulled out of them is like doing liver surgery or something, right? It's just because people are not in ... So I shouldn't say people. Some people are not natural content creators, and when you say, "Well, we wanna tell stories about this great thing," they're like, "Nah, I don't really wanna do that." So what advice do you have for our listening audience, all of whom should be trying to tell fantastic employee stories? What's the way to actually harvest those stories in the organization so that people aren't like, "The last thing I wanna do is talk to Jörgen about my job." Jörgen Sundberg: Yeah. So I think try to understand how individuals like to consume content, first of all. So, you know, some are auditory, listen to a podcast, others are visual, others like to write things or read things. So if somebody's really into podcasting, or they watch YouTube videos, then perhaps just say, "Okay, you know, here's the voice recorder on your iPhone," or, "Here's a room where we've got a camera set up, and you, perhaps you just, you know, go in there and shoot some footage and we'll see what happens." So I wouldn't force people, force behavior as in, "You have to write an 800-word blog post today," because that's not gonna work. So it has to become ... come about naturally. So it's more about encouraging people to perhaps create content where they consume content. But that's one bit. But then also think being proactive. If budgets allow, then sending in a roving reporter to go round different departments and perhaps ... Yeah. Pulling out stories out of people, I think that could be really powerful because, yeah, everyone thinks that they're own job is dull and boring. But from the outside, someone has an outside perspective, coming in from a different office can see things in a very different light. So, yeah, if you combine those two, you should find some success. Adam Brown: That actually brings up a really interesting follow-up question. Obviously a lot of brands are doing kind of ambassador programs with their active employees. And a big part of that can be recruitment of new employees. I'm curious kind of how you feel about those programs, and how you feel about technologies. Like Hearsay Social and Dynamic Signal that help brands kind of empower their employees with content that's approved, that's curated, you know, that can also kind of continue to share that message on the brand's behalf. How do you look at that kind of from an HR standpoint or a employee recruitment standpoint? Jörgen Sundberg: Ah, so you mean the actual technologies in themselves? Adam Brown: Well, both of the ... kind of the technology itself as well as just that idea of, you know, ambassadors, and in some cases, empowering those who have the ability, 'cause you said, you know, you'll write a 300- or 400-word blog post to be able to do that. But then also kind of keeping perhaps some employees a little bit more on a rail, where they're sharing approved and vetted type of content. Jörgen Sundberg: Yeah. So I think, especially if you're working in a heavily regulated industry, such as banking, finance, insurance, people are a little bit concerned and worried about, you know, "Can I share this?" or, "Would this be perceived as me saying just a little bit too much?" or, "Is this internal information?" So, if it's been vetted through an app, through Dynamic Signal or similar, then that's going to make it easier for people to share. And, of course, if you're using one of these technologies, then you can also measure who's sharing what, who's having success, and you can plug in gamification in there. And, you know, these vendors are all, of course, very good at calculating how much media spend equivalence you've saved, so that you can keep paying their fees. So there are certain benefits for that, and I think some of the challenges with the technology ... So I think employee advocacy is not a technology, it's more a mindset to methodology. And the technologies are working well at the moment, but I think give it a little bit of time until Facebook, LinkedIn, wake up and say, "Hang on. You know, IBM are sharing 1,000 articles a day through their employees, so they're all using the same tool through our API here. Well, shouldn't we be actually charging these guys for that?" So I think something will be shaking up. And the other challenges as well, and you guys have iPhones. We've established that. If you look at your phones, how many apps have you got in there? How many apps have you only opened once? So why would you ... Why would employees be expected to open employee apps? Yeah. Jörgen Sundberg: It's probably the last thing you wanna do on the bus or on the weekend. So they have to fight with Instagram or games, and everything else that's going on in your phone. Jay Baer: I'm glad Adam asked about the technology implications for employee branding and employee advocacy in social media. On a somewhat related topic, I wanted to ask you how you feel about Glassdoor, Indeed, et cetera, and kind of the employer rating portals. You know, as essentially Yelp for employers or Trip Advisor for employers. How do you feel about those platforms, and do you think that provides good information A) to employers ... to employees, I should say, and B) how important is it for employers, for brands, to cultivate high scores there? I mean should they really be making sure that their employees are adding ratings and reviews of the business, that their CEO ratings are high, that kind of thing? Just how important are those sites in your estimation? Jörgen Sundberg: So I think they're increasingly important. So Glassdoor is probably the leading one, but you have other places like Indeed and Regional Ear as well. In Europe there's one called [Canooner 00:26:41]. There's Ambition Box in India. There's I Love Mondays in Brazil. And so these sites, they're all about reviews. So reviews coming in from candidates, from employees, and from alumni. And very much like Trip Advisor, they normally accept everything, and then the ... It can actually be some employers complain that they can't really take down what they believe to be untrue reviews. So that that's a slight issue right there. But I don't think you should be chasing the number, the score, which most companies actually do. They say, "Okay, we want to be above four out of five on the scale." But I think more important what you wanna do is to use a tool like Glassdoor, and to take heed of the feedback you're getting. So think about, "How can we fix things? Okay, so this person, let's take their review with a pinch of salt, but there's probably some truth in this. Let's go back to their respective manager. Let's go back to that team, and see what actually happened here. Is there something we can do about these processes to change things for the better?" And also, at Link Humans, we've developed something we call, The Employer Brand Index, employerbrandindex.co by the way. A little plug. But what we do is we look at all publicly available data across social media, employer review sites such as Glassdoor, Google, and Forums, and we try to build a picture of all those state [inaudible 00:28:11] and put it all into one report for our clients, so that they can then act, and ultimately fix things that people are complaining about. And some people, some things, you can fix very easily, within HR. Perhaps there's just a, you know, a little routine. Other things, such as, you know, salary levels are on average 10% lower than a competitor's, that's gonna cost a lot of money on the bottom line. But at least it's on the radar for the company. So it's hugely important to know what's going on, but taking it one step farther, you need to act on it as well. Adam Brown: I really like that. It's almost like a net promoter score for an employee kind of type, satisfaction. Jörgen, what was that URL again? Adam Brown: Fantastic. Thank you. Last question for me, and I know we kind of teed it up earlier. And what you were just talking about with Glassdoor and the other types of sites, I think, is very apropos here. Is that an opportunity where you can kind of use your alumni, or even your active employees, to kind of respond on your behalf? And I guess this is a two-part question. Number one: Specifically for things like Glassdoor, do you try to, you know, get your alumni, former employees, to go on there and tell the story, and be that source of truth? And secondly, how do you continue to use your alumni and your former employees in other initiatives and activities, whether it's on social media or in other types of opportunities? Jörgen Sundberg: Yeah. I think a company like L'Oreal, for instance, they actively encourage current employees and alumni to go onto Glassdoor and other sites just to write about their experience. And they don't say, you know, "It has to be very positive," or, you know, "Write great things about us." It's more about, you know, "We want to hear your honest opinion, more what your time was like." And so I think definitely leverage people, 'cause most people are probably had a good experience working with you, and are happy to write it up. Then they probably didn't even think about Glassdoor. Jay Baer: You tend to get 1-star reviews and 5-star reviews. Jörgen Sundberg: Yeah. Exactly. So it's good to try to even things out a bit. Adam Brown: But I don't see that as much in Glassdoor. I know you may not have seen this either. But when I've done some analysis of Glassdoor and Indeed, I don't see that same kind of polarity. And I haven't done the full math on this, so this is purely anecdotal. But I see a lot more, say, 3- and 4-star kind of feedback loops on Glassdoor and Indeed versus a consumer facing portal like a Yelp or Trip Advisor, et cetera. I should do an analysis on that formerly some time. But I do see a lot more balanced and more nuanced ratings and reviews of employers on those platforms, which I think it's ... I'm really glad you mentioned how important it is, not just to chase the score where 4.3, "Yeah, high five", but to say, "Look if somebody, an employee, is gonna take the time to leave us a review, there's probably something we can learn from that." Adam Brown: That's a great point. Jörgen Sundberg: There will have been pigs in troughs. But where people really complain is ... are people ... places like Reddit or Quora, you know, an engineer's had a terrible experience. He's gonna tell everyone he knows on those places. So that's where you would really wanna look in. But yeah, back to Adam's question round alumni. So, yeah, absolutely. And I think that's something that's been neglected over the last few years. Really try to cultivate a strong alumni network, because they will ... they're very good at referring new employees to the company, and they might even boomerang, come back. So whether you do that through social media. So that you see a lot of these alumni groups perhaps on LinkedIn. I don't know how much engagement takes place in those, but if you can try and combine it with actual in-person events. So get your alumni back every quarter or every six months, perhaps, to tell their stories about where they went after they left your business. And I think that that's super powerful and that also allows junior members of staff to see that, "Okay, you know, I'm gonna be here and I'm gonna dedicate my next two or three years to this company. But when I leave, I'm still gonna be welcomed back and treated with respect," so it's not just the, you know, "We're gonna burn bridges with anyone that leaves." Jay Baer: You're gonna also make sure that people know that you have also written a book on this topic called, Employee Advocacy: The Ultimate Handbook, available online right now. In fact, I believe the Kindle version is free, which is extraordinary and magnanimous, so go to your local Amazon-enabled computer or phone, and look for, Employee Advocacy: The Ultimate Handbook, by our guest today on Social Pros, Jörgen Sundberg. Jörgen Sundberg: Right. Thank you. Jay Baer: And we'll make sure to link that up on socialpros.com as well as the Employer Branding Index. 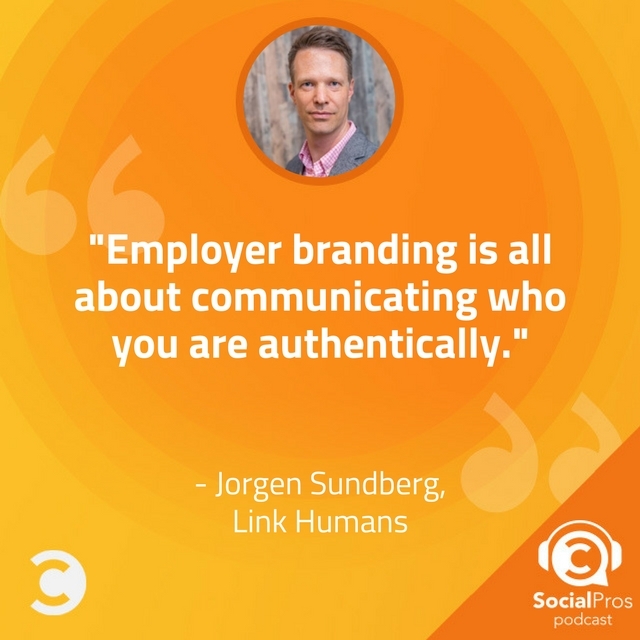 Also we'll link to Jörgen's podcast, The Employer Branding Podcast. And of course, ladies and gentlemen, every single episode of this program, all 300 and something episodes are now at socialpros.com complete transcripts and all the links that we mentioned in the show. So go there if you missed anything live on the program. Jörgen, I wanna ask you the two questions we've asked every single guest here on the show since we began. The first one was what would be, what one tip would you give somebody who's looking to become a social pro? Jörgen Sundberg: Gosh. Okay. I think to become a social pro, you first have to be a business pro, or almost a life pro. So it's no good just being on social for social sake. You actually have to have some subject matter expertise. So in my case, that was recruitment in HR. In your case, it could be retail or travel. But try to understand an industry, get to know the players and so on. And that's when you can really leverage social. Jay Baer: I love that advice. 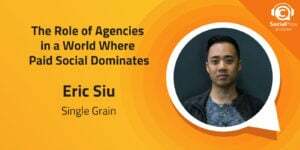 That it really helps to have some sort of expertise, not just about social, but about some other topic or a category that makes you authoritative, and then you just add your social knowledge on top of that like frosting on a cake. I think that's a really smart point. And one that we don't actually hear very often when we ask that question. So thank you for adding that perspective. Jay Baer: The last question for Jörgen Sundberg, live from the UK, founder and CEO of Link Humans, author of, Employee Advocacy: The Ultimate Handbook, and the host of the Employer Branding Podcast, if you could do a Skype video call, my friend, with any living person, who would it be and why? Jörgen Sundberg: Oh, my goodness. Okay. You're probably gonna hate me for this, but Donald Trump. I'd just like to have a chat with the guy and see what goes on inside his head. You know, he's an interesting character, and yeah. I'm sure that would be very insightful. Jay Baer: He certainly is interesting character and I'm not gonna comment on my own predilections, but a third of our country, at least, would be delighted that you provided that answer. And since it doesn't seem like he's gonna set foot in the UK any time soon, it feels ... and apparently is unwelcome, that maybe the Skype call is gonna have to suffice, not only with you, but also with your leadership. So it's gonna .... maybe a Skype call between Theresa May and Donald Trump may be in the offing, 'cause that may be as good as it gets. Jörgen Sundberg: Absolutely. Yeah. Look forward to it. Jay Baer: Jörgen, thank you so much for being on the show. Congratulations on all the success with Link Humans and the book, and the podcast. We really appreciate you taking time to come on the Social Pro show. Jörgen Sundberg: Thank you so much for having me, guys! Jay Baer: An absolute pleasure. Thank you as well. Next week on the show, we're gonna talk to Phil Moad, who's the head of Digital for the Calgary Stampede, which is the largest rodeo in the world, and an incredible, incredible event each year in Alberta, Canada. And he has a really interesting story to tell, so that's gonna be pretty great next week. So, until then, on behalf of Adam Brown of Salesforce Marketing Cloud, I'm Jay Baer, founder of Convince & Convert. Thanks, as always, for listening to Social Pros.